Who’s up for some hop fries? Beer and fried potatoes is the quintessential pub pairing, and in the newly released American Burger Revival, co-authors Samuel Monsour and Richard Churdy combine the duo into one suds-soaked dish for these crispy curled potatoes. To make the Citra hop seasoning, mix the seasoning ingredients together in a small bowl and set aside until you’re ready to season fries. To prepare the potatoes, run them through a spiral cutter (alternatively, slice into long, thin pieces). As the fries are cut, immediately soak them in IPA seasoned with the salt. Soak for at least 1 hour and no more than 4 hours. Drain thoroughly. Heat the frying oil to 375 degrees F and begin frying the potatoes in batches until golden brown and crispy, about 3 to 4 minutes per batch. With a slotted spoon, remove the fries from the oil and place onto a brown paper bag. Sprinkle with Citra seasoning. 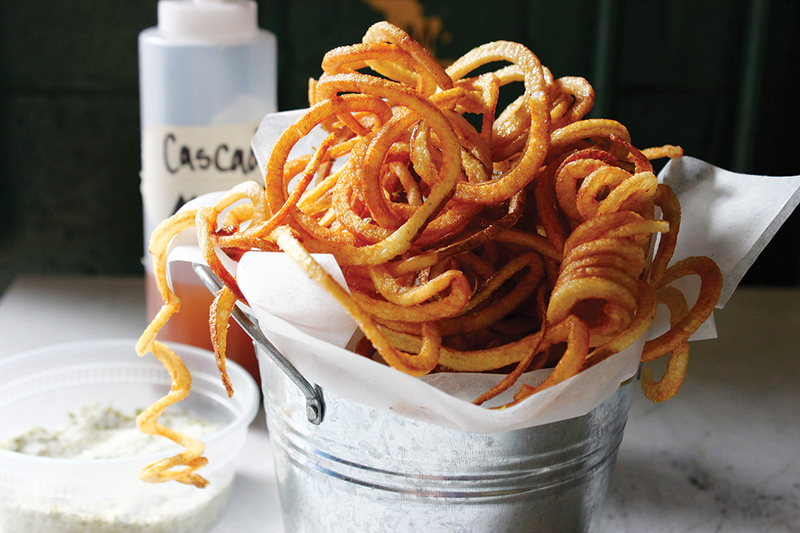 Repeat steps until all fries are cooked. Enjoy with Cascade malt vinegar. Serves 2-4. Reprinted with permission from American Burger Revival: Brazen Recipes to Electrify a Timeless Classic by Samuel Monsour and Richard Chudy. Published by Union Park Press. A simple mix of Cocchi Americano Bianco, elderflower liqueur and soda water.